Ms. Yingling Reads: All the books with Hamsters! All the books with Hamsters! I should probably be doubting ALL of my life choices at this point; I have become the go-to person for any book with "barf" or "poop" in the title, Notebook Novels on any topic, and now, apparently, rodent themed speculative fiction. At Young Adult Books Central, I seem to be the local expert on Geronimo Stilton books. But maybe I shouldn't feel too bad. These are all titles that my students adore. Sure, I'd rather curl up with some Sonnenblick, but when I can have lengthy and analytical conversations on the literary and artistic merits of Stick Dog versus The Platypus Police Squad with my students, perhaps it engenders a special rapport. Will someone please let me know if I start trying to entertain adults with armpit farting noises or laughing out loud at the emission of bodily noises? It's bad enough that I have to restrain myself from high-fiving adults in professional settings! Al Chaudhury is getting by in his British coastal community. His father has passed away, his mother is dating a decent enough guy, and his grandfather is a steady if quirky presence in his life. On his 12th birthday, Al receives a letter from his father who claims that Al needs to break into their former house and use a homemade time machine to save his father from a serious go kart accident that eventually caused his death. This is not an easy task, and it is complicated by having to explain his absence in the present, technical difficulties with 1980s computers, the fact that he and his 12-year-old father are almost identical, and the peril his hamster faces when caught in the past. Al perseveres even though a positive outlook seems unlikely, especially after his intervention seems to make matters worse. While I am always a sucker for a time travel book, this one was especially good. The use of rudimentary computing devices, as well as an old-fashioned bathtub, to make a time travel machine is brilliant and will appeal to students who love technology. Al's multicultural background adds some amusing quirks as well as realistic problems, and his grandfather definitely makes it into my top five favorite literary grandfathers, along with Gene from Gephart's There Will be Bears and the bodybuilding grandfather in Herbach's Gabe Johnson Takes Over. The best part of the book was the fact that while Gabe was coping with the absence of his father, he had so many good memories of their time together that he tried everything he could to try to avert his loss, even when it meant believing in the unbelievable and imperiling his own future. My only criticism of this is that the hamster just didn't have a big enough role, but I'm willing to forgive that because of this line: "My dad died twice. Once when he was thirty-nine and again four years later, when he was twelve. " 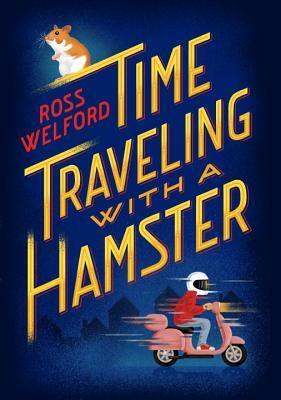 When a hamster appears randomly in Sam's 6th grade classroom, the students are excited, especially Martha, who appoints herself the "hamster monitor". When the hamster disappears, the teacher is relieved, but Sam keeps catching glimpses of the rodent. When he sees the animal ingest a large quantity of body building supplement, its name becomes more apt-- Hamstersaurus Rex grows a scaly tale and wicked teeth, and develops a voracious appetite. Sam tries to take good care of the hamster, but is thwarted by the sheer amount it eats, his mother's fur allergies, and its habit of disappearing at inopportune moments. Sam's difficulties with Kiefer "Beefer" Vanderkoff, the class bully, don't help, nor does Martha's interest in finding the animal or her attempts at befriending Sam and inviting him to visit the local doll museum with her... and to travel there on a tandem bicycle. Throw in a physical education competition and a forgotten science fair, and Sam's week has become VERY complicated. O'Donnell, who wrote the very original and amusing Space Rocks!, has created another humorous book full of lots of great lines and unusual situations. While I'm not a huge fan of stereotypical bullies who give smaller children "swirlies", Beefer takes this to a new level, adding pancake mix to the water, causing Sam to rock a "sad unicorn" hairdo for the day. He even considers adding cement mix, but that attempt doesn't end well! It's the little details that made me snort with laughter. Referring to food as "hamster-tricious AND hamster-licious" might be a short lived fad in my household, and I have to admit that I sort of want to smear white glue all over my face so I can "enjoy the sensation of peeling it off"! The pictures added a lot to the story and will cause a lot of fans of Burnam's Teddy Mars, Lombardo's Mr. Puffball series and Fry's The Naughty List to pick it up. This is a rare book that mixes two very big elementary concerns (Hamsters! Dinosaurs!) in with a solidly middle school experience, making it perfect both for elementary students who are curious about middle school and middle school students who want some comfort reading that reminds them of a simpler time. The best part of this book, though, was Sam. He was such a likable character, and his insistence in taking care of the hamster despite a number of difficulties was oddly touching. He was respectful in all of his dealings with classmates, even Beefer. I especially liked how he went to the doll museum with Martha because he had promised her, and how he reacts when his best friend, Dylan, brings him to task for not including her in his plans. 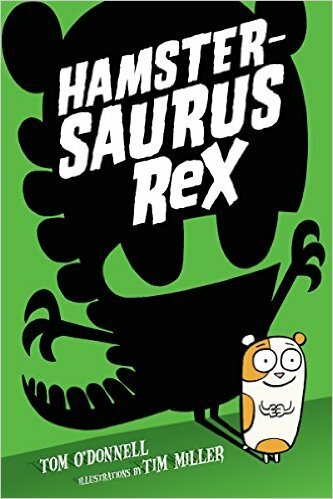 Hamstersaurus Rex may seem very silly on the outside, but I appreciated the fact that it was also a very heartfelt book. And one realistic fiction one, for good measure. When his class covers careers and the teacher asks students to pick one to present to the class, Humprey starts to wonder what jobs he can do other than just being the class hamster. Thinking that career opportunities for hamsters are limited to being a pet, Humphrey starts to brain storm and comes up with ideas such as being a detective or hamster entertainer. 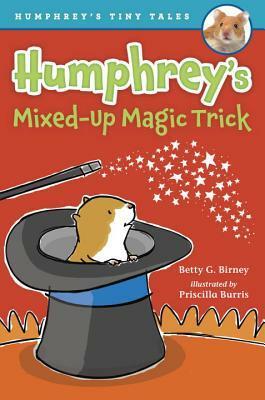 When Miranda decides to present about being a magician, she enlists Humphrey's assistance for her tricks, and Humprey's skills and cool head during a magic emergency assure him that this career path is one he could pursue should he need to. These eight Tiny Tales books are on a slightly easier level than the According to Humphrey series. With large, well-spaced font and attractive pictures, these are a great alternative to I Can Read books for younger children who can read on their own. Humphrey is an observant and well-behaved hamster who keeps a notebook of his ideas but doesn't actually converse with the children. There are a few diverse characters, and some positive cultural moments-- a classmate tells Miranda that girls can't be magicians, and the teacher gently points out that they certainly can. While I am not entirely sure that this is a good career path for students, I do actually know two full time, employed magicians! For readers who enjoy Dr. KittyCat, Lola Levine, or the Owl Diaries, Humphrey's Tiny Tales are a good introduction to chapter books for beginning readers.